This transcendental movement in America began with the 1836 publication of Emersons Nature in which he eloquently espoused the simple notion that God could be found in every form of natural life. Louis Comfort Tiffany was greatly influenced by transcendentalism, expressing his spirituality by placing biblical figures in American landscapes, and achieving great aesthetic sentiment in the colors and hues of foliage and fauna. 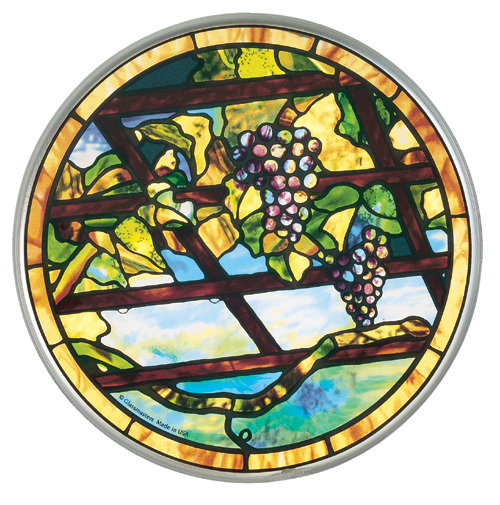 The grape trellis was a favorite motif for Louis Comfort Tiffany, utilized in several table lamps and chandeliers. The rich shades of purple and blue express the exquisite ripeness of the grapes and complement the autumnal sky in a reflective interpretation of the abundance of the autumn harvest and the sanctity of the gift itself.